Differential equations arise in many areas of science and technology: whenever a deterministic relationship involving some continuously varying quantities (modeled by functions) and their rates of change in space and/or time (expressed as derivatives) is known or postulated. This is illustrated in classical mechanics, where the motion of a body is described by its position and velocity as the time varies. Newton's Laws allow one to relate the position, velocity, acceleration and various forces acting on the body and state this relation as a differential equation for the unknown position of the body as a function of time. In some cases, this differential equation (called an equation of motion) may be solved explicitly. An example of modelling a real world problem using differential equations is determination of the velocity of a ball falling through the air, considering only gravity and air resistance. The ball's acceleration towards the ground is the acceleration due to gravity minus the deceleration due to air resistance. Gravity is constant but air resistance may be modelled as proportional to the ball's velocity. This means the ball's acceleration, which is the derivative of its velocity, depends on the velocity. Finding the velocity as a function of time involves solving a differential equation. Differential equations are mathematically studied from several different perspectives, mostly concerned with their solutions—the set of functions that satisfy the equation. Only the simplest differential equations admit solutions given by explicit formulas; however, some properties of solutions of a given differential equation may be determined without finding their exact form. If a self-contained formula for the solution is not available, the solution may be numerically approximated using computers. The theory of dynamical systems puts emphasis on qualitative analysis of systems described by differential equations, while many numerical methods have been developed to determine solutions with a given degree of accuracy. The study of differential equations is a wide field in pure and applied mathematics, physics, meteorology, and engineering. All of these disciplines are concerned with the properties of differential equations of various types. Pure mathematics focuses on the existence and uniqueness of solutions, while applied mathematics emphasizes the rigorous justification of the methods for approximating solutions. Differential equations play an important role in modelling virtually every physical, technical, or biological process, from celestial motion, to bridge design, to interactions between neurons. Differential equations such as those used to solve real-life problems may not necessarily be directly solvable, i.e. do not have closed form solutions. Instead, solutions can be approximated using numerical methods. The theory of differential equations is quite developed and the methods used to study them vary significantly with the type of the equation. An ordinary differential equation (ODE) is a differential equation in which the unknown function (also known as the dependent variable) is a function of a single independent variable. In the simplest form, the unknown function is a real or complex valued function, but more generally, it may be vector-valued or matrix-valued: this corresponds to considering a system of ordinary differential equations for a single function. Ordinary differential equations are further classified according to the order of the highest derivative with respect to the dependent variable appearing in the equation. The most important cases for applications are first order and second order differential equations. In the classical literature also distinction is made between differential equations explicitly solved with respect to the highest derivative and differential equations in an implicit form. A partial differential equation (PDE) is a differential equation in which the unknown function is a function of multiple independent variables and the equation involves its partial derivatives. The order is defined similarly to the case of ordinary differential equations, but further classification into elliptic, hyperbolic, and parabolic equations, especially for second order linear equations, is of utmost importance. Some partial differential equations do not fall into any of these categories over the whole domain of the independent variables and they are said to be of mixed type. Both ordinary and partial differential equations are broadly classified as linear and nonlinear. A differential equation is linear if the unknown function and its derivatives appear to the power 1 (products are not allowed) and nonlinear otherwise. The characteristic property of linear equations is that their solutions form an affine subspace of an appropriate function space, which results in much more developed theory of linear differential equations. Homogeneous linear differential equations are a further subclass for which the space of solutions is a linear subspace i.e. the sum of any set of solutions or multiples of solutions is also a solution. The coefficients of the unknown function and its derivatives in a linear differential equation are allowed to be (known) functions of the independent variable or variables; if these coefficients are constants then one speaks of a constant coefficient linear differential equation. There are very few methods of explicitly solving nonlinear differential equations; those that are known typically depend on the equation having particular symmetries. Nonlinear differential equations can exhibit very complicated behavior over extended time intervals, characteristic of chaos. Even the fundamental questions of existence, uniqueness, and extendability of solutions for nonlinear differential equations, and well-posedness of initial and boundary value problems for nonlinear PDEs are hard problems and their resolution in special cases is considered to be a significant advance in the mathematical theory (cf Navier–Stokes existence and smoothness). In the first group of examples, let u be an unknown function of x, and c and ω are known constants. The theory of differential equations is closely related to the theory of difference equations, in which the coordinates assume only discrete values, and the relationship involves values of the unknown function or functions and values at nearby coordinates. Many methods to compute numerical solutions of differential equations or study the properties of differential equations involve approximation of the solution of a differential equation by the solution of a corresponding difference equation. Many fundamental laws of physics and chemistry can be formulated as differential equations. In biology and economics differential equations are used to model the behavior of complex systems. The mathematical theory of differential equations first developed, together with the sciences, where the equations had originated and where the results found application. However, diverse problems, sometimes originating in quite distinct scientific fields, may give rise to identical differential equations. Whenever this happens, mathematical theory behind the equations can be viewed as a unifying principle behind diverse phenomena. As an example, consider propagation of light and sound in the atmosphere, and of waves on the surface of a pond. All of them may be described by the same second order partial differential equation, the wave equation, which allows us to think of light and sound as forms of waves, much like familiar waves in the water. Conduction of heat, whose theory was developed by Joseph Fourier, is governed by another second order partial differential equation, the heat equation. It turned out that many diffusion processes, while seemingly different, are described by the same equation; Black-Scholes equation in finance is for instance, related to the heat equation. 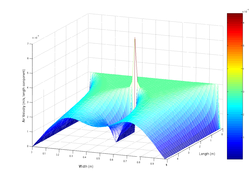 Differential Equation Solver Java applet tool used to solve differential equations. Differential equations is one of the things I am currently working on. In biochemistry, many logical properties of biological circuitries are in fact emerging properties of underlying dynamical systems which are completely modelled by Ordinary Differential Equations, or Stochastic Differential Equations when including noise. The transition from ODEs systems to logical systems is the hard point biomathematicians have to deal with at present.